Take a look around next time you're out driving, and you'll see plenty of Ram 1500s. Consistently a top seller, it's more popular than most other light-duty pickups. While towing and hauling are certainly part of its appeal, this truck also has some appealing safety features. Having the largest brakes in its class can boost safety. 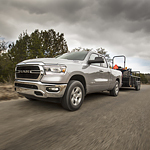 The Ram 1500 has 14.9-inch brakes, which helps you and whatever you're carrying stop better in shorter distances. Imagine how great that will be when you're driving through Ingersoll after school or work. Feel safe knowing that your Ram 1500 has advanced airbag technology with six standard airbags for maximum protection. Driver and front passenger bags include adaptive venting technology, which offers an extra layer of protection. Visit Glassford Chrysler showroom to test drive the Ram 1500, and check out the features for yourself.